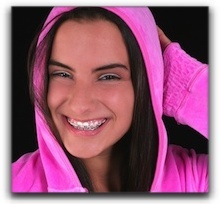 Think About Clear Braces, Allen Park! Welcome to our cosmetic dental blog. We’re Drs. Greg & Joanne Szalai of Szalai & Szalai DDS, a full-service Allen Park cosmetic dental practice. We have been practicing general and cosmetic dentistry in Allen Park, Michigan since 1987. During this time, we have developed many rewarding relationships with our patients and staff members. Many dental patients have chosen cosmetic dentistry, including porcelain veneers and clear braces, to correct misaligned teeth. Allen Park children with less-than-perfect smiles often feel self-conscious about their teeth. It is extremely satisfying to help a child or teen achieve a smile they can be proud of. Attractive teeth boost self-esteem for Detroit area people of all ages. There are now several different types of braces available in Detroit including ceramic, self-ligating, and lingual (Invisalign). We will help you choose the best type for your particular situation. If you would like to discuss teeth-straightening options, we invite you to schedule a cosmetic dental consultation by calling 313-928-2323. Perhaps your teeth are straight but have other imperfections. Teeth whitening, dental crowns and bridges, porcelain veneers, cosmetic bonding, gum contouring, and crown lengthening all deliver fantastic results. At Szalai & Szalai DDS we have been creating brilliant smiles in Michigan since 1987. We specialize in general dentistry and extreme smile makeovers. Many Detroit folks have an aversion to dental visits. If you have delayed treatment because of dental anxiety, talk to us today. Don’t let fear and anxiety prevent you from getting the care you need.